With typhoon #18 kicking in, and rain spreading across Tokyo, the sensible idea would be to go home and relax in front of Netflix and catch up on those TV shows from overseas. For some crazy reason though, I decided to trek up to Shinjuku to visit Vector Beer, and its sister bar Vector Beer Factory, in the search for some cheap beers and meat. 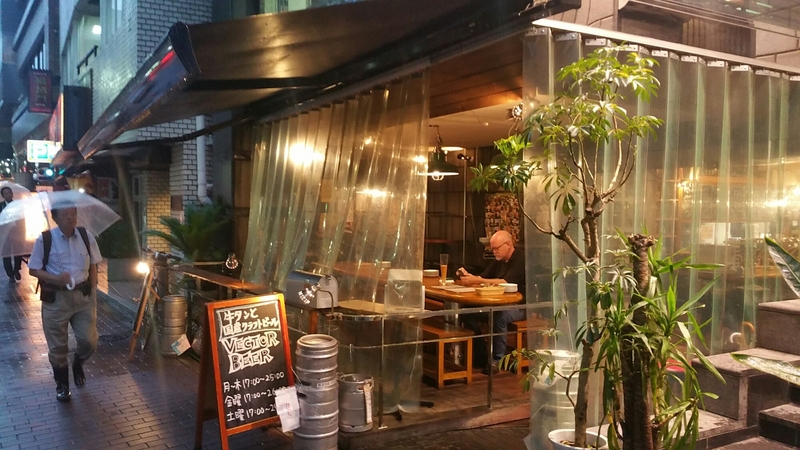 It’s located a short walk from Shinjuku Park, aka Shinjuku Gyoen, and opened at the end of 2013, specialising in craft beer and tongue – the appendage from cows though don’t worry, there are other foods available. From the outside, Vector Beer is a flash little bar, with a canopy covered section outside that is heated during the winter and cool in the summer, with plenty of seating inside at the counter and rows of tables next to the wall. There is a big sign outside so it’s a hard place to miss, especially when there isn’t much else around in the sanchome area of Shinjuku. Turning up at 5:30 on a weekday meant that there was plenty of seating available but the place quickly filled up with people in search of cheap Japanese craft beer and food. Plenty of choices but avoid the bottles. Vector Beer has 10 taps of beer, with nine of those being Japanese craft beer and one tap of Carlsberg, though I’m unsure whether the Carlsberg is on tap all the time. Beers come in two sizes, a glass at ¥450 and US pints at ¥750. 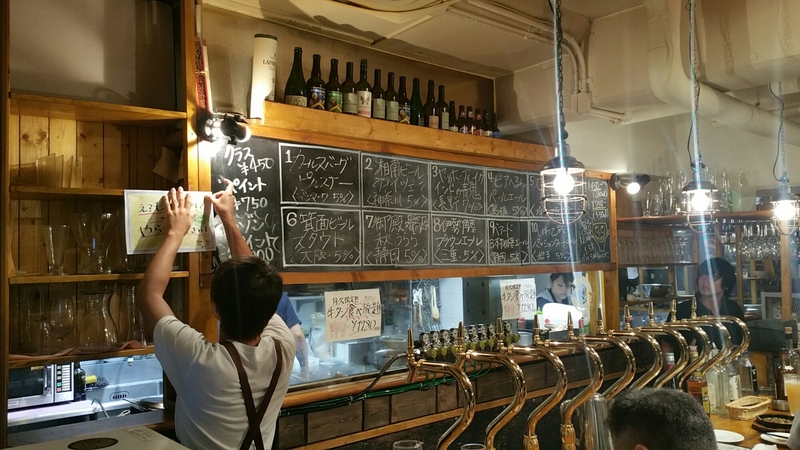 There is also a three-beer tasting set available too for ¥1,000 where you can choose any three beers (200ml) from the ten regular beers on tap. All prices include tax too. The taps rotate regular from a variety of styles from Japan. There are also bottles available of Japanese craft beer, but at almost ¥1,000 yen a bottle, we avoided them like some iffy regular domestic beer. Plenty of choices at reasonable prices. If it wasn’t for the table charge. Gotemba Kogen Aki – reminded me strongly of Kirin’s Akiaji. Who needs all that head on the beer anyway? Table charges – ok, you will get some small portion of food, in this case, some shellfish but it would be better if they just scrap the table charge and place an extra ¥50 on the beer. Smoking – smoking is allowed anywhere in Vector Beer and its annoying. I want to smell my beer and food without the threat of smoke blowing across the place. I have no problem with smoking but I wish there were a segregated area. Plenty of meat options on the menu. But plumped for the nachos. Gripes aside, the food at Vector Beer isn’t just cow tongue. The menu was heavily biased towards meat but there was some vegetarian options too as well; however, I couldn’t look past the chips and nachos – simple food but always an easy choice for someone so indecisive like me. Both came up quite large and were both cheap though the smoke across the bar soon became too much. Vector Beer could have been much higher up our list of places to drink at, if it wasn’t for table charges and smoking. If you don’t mind either of those, then Vector Beer is a good place to drink at if you’re looking for somewhere outside of the usual drinking areas of Tokyo. The late hours on a weekday are also a bonus too if you finish work late and in need of a beer. The closest station to Vector Beer is Shinjuku Gyoenmae on the Marunouchi Line on the Tokyo Subway. Take exit three, turn right out of the exit, and turn right at the FamilyMart. Vector Beer is located straight up that road on the right. You could walk from JR Shinjuku but it would take about fifteen to twenty minutes. I’ll be terse about the two things here which rub you (as well as I) the wrong way. ① The cover charge is there to discourage pub crawls. For me, I am not that keen to intentionally leave one venue for another (if the beer or the atmosphere is just unsettling to me, then I will leave ~ there has been bars in Tokyo which I left). I go on record that when someone orders his third beer at that venue, the cover charge should be refunded. ② It may surprise you to learn that smoking was permitted in bars in Illinois (including Chicago) until 2008. A classic craft beer bar which even you may have heard of, the Map Room, would not prohibit smoking in it. Its reason was: A non-smoker will habitue a venue that allows smoking. A smoker will not habitue a venue that prohibits smoking. As many of its patrons arrived in a group, it felt it would lose too much business if it prohibited smoking while nearby competitors permitted it. This is probably the logic why it continues in Tokyo. 1) The cover charge is a ridiculous idea. I wouldn’t say it was to stop pub crawls but rather to ensure people stay there and spend some money. But you’re right, it should be removed from the bill at some point. Pub crawls aren’t common in Japan compared to overseas. Most drinking occurs in izakayas or the such, with then perhaps some moving onto karaoke or snack bars. 2) Smoking doesn’t surprise me at all – growing up in the UK meant all bars were smoking until 2007. It occurs in Tokyo still as Japan Tobacco, aka JT, is partly owned by the Japanese government – I think they own 50% of the company. Ban smoking, and they reduced the amount of smokers which reduces taxes. Until the government reduces its shares to a minute amount or loses a lawsuit about the effects of smoking, then it will continue to occur. There have been two major court cases brought against JT that were both shot down by the court which is controlled by the Japanese government.